On Iris board V1.1A: Connect one end of the null modem cable to the serial port of the PC and the other end of null modem cable to connector X14. 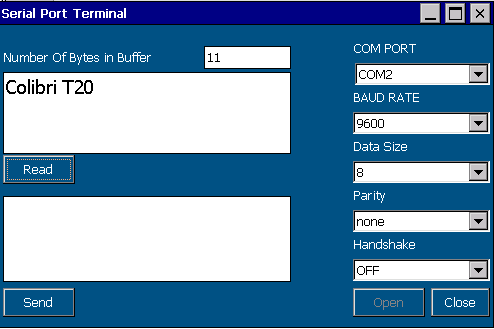 Use a terminal application, such as Tera Term to open a terminal connection on the PC with these settings: 9600 Baud/ 8 Data Bits/ No parity/ 1 Stop Bit. This application demonstrates how to read and write data using CoM port. Navigate to Solution Explorer in visual studio->Right Click on Solution > Properties > Devices. After deploying the program to Colibri module. Go to My Device > Program Files > vcsharp_uart_demo. Double click on the vcsharp_uart_demo.exe to run the application. Send message from PC (work station) and you will see the number of bytes in buffer, press Read button to read message received from PC (work station).